We leave for California on Sunday. We will be visiting my in-laws until the 31st. I am preparing several embroidery projects to bring along as well as selecting three (or four, or maybe five, or six) books to read while we are there. 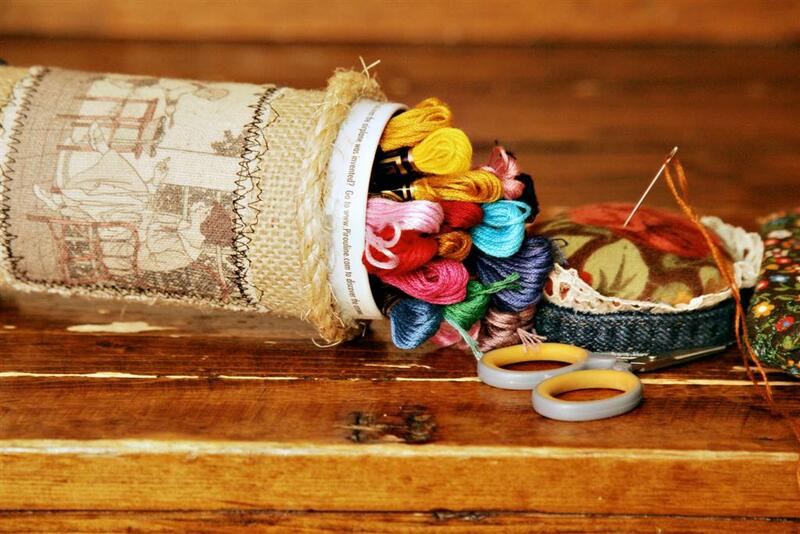 I wanted something to corral my embroidery floss. 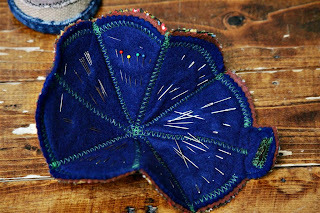 I also thought it would be nice if it had a pin cushion on top as I have a bad habit of sticking my needles into the arms or cushions of chairs where they get lost. I got the image of the woman mending from The Graphics Fairy. I printed the image on fabric and sewed it onto the burlap - the rest is hot glue history. Here is the inside of the my needle book, I got it from a friend several years back. Isn't it cool? Just beautiful! 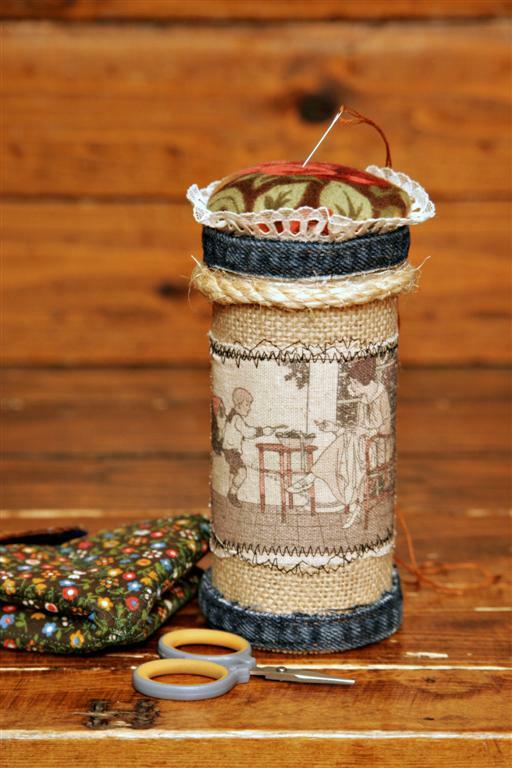 I love the look of the floss container and the design of the needle book is awesome! Love it! 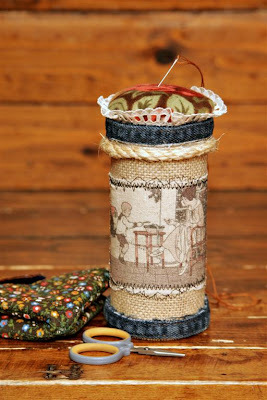 You really have developed your own style of decor for all the little containers you are making.. it really works! And yes - cool needle book! Your canister is awesome, I love it. Smart gal to bring stuff with you! I think you need to change your name to the container girl!! I love the needle book. I need something like that. I can't ever find a needle when I need one. Safe travels my friend and Merry Christmas!! Great idea! Kinda jealous you are going to California. I haven't been there in 2 years, and it seems like forever. I was just sitting here earlier today, gazing out my door at 4 inches of snow, and 27 degrees, and wishing for Long Beach where it was 65 and balmy today. Ah well, we have the seasons, that's supposed to count for something right......? Love the caddy! 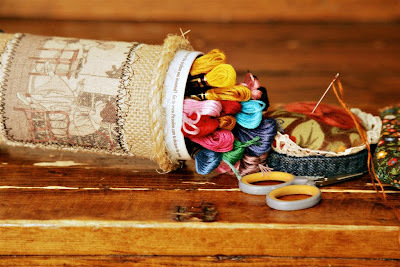 What a perfect little way to package all those embroidery necessities! Have a great trip! You make printing that image on burlap sound like a piece of cake :)!! It sounds as if you will get to catch up on some "me" time while you are gone. Hope you have a wonderful Christmas and trip! Thanks for your congrats! How perfect! No more needles in the arm of the couch! My kitty will be so pleased about that one. I also have a bad habit of holding a needle in my lips - which sets a really bad example for my daughter. that is super cute, I'd like to make one too. Happy vacationing...you might want to bring an umbrella if you are coming to Souther California, it's been raining like crazy here. Great idea! I say this often, but you are one very creative lady! I wish you safe travels and a very happy Christmas! ps. What books are you reading? That is so cute. I like the graphics fairy too, she has some cute stuff. Happy New Year Melissa!